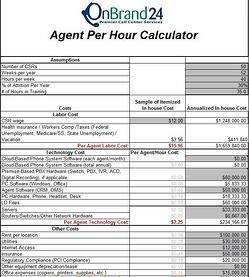 Download Our Call Center Agent Cost Calculator For Free Now! Do you know what your current cost per hour is for your customer service agents? Most companies we talk to don't have a clue and typically underestimate their true costs. That's why we've developed a calculator which takes into account the cost categories we believe will help you define your true agent per hour cost. To find your true call center agent per hour costs simply download the calculator, plug in your figures, and let the calculator do the rest. Fill out the form to the right to access the calculator now! Fill Out The Form Below To Download The Calculator!